MADISON, Wis. — A century after it was first proposed, a broad pedestrian corridor that will serve as a new gateway to the University of Wisconsin here is close to its final form. A seven-block pedestrian corridor links the University of Wisconsin campus in Madison to rental apartments and businesses. The corridor, called the East Campus Gateway, includes private developments, university buildings and two public gathering places, one owned by the university and the other by the city. A recent burst of construction has given students a new services center and a shopping mall geared to their needs called University Square. And, in a city with a vacancy rate of less than 3 percent, hundreds of new rental apartments are filled with both students and town residents. “The idea was to create a new front door to the university,” said Gary Brown, the director of campus planning and landscape architecture, and one of the two university staff members who played central roles in managing the recent construction. Pieces of the seven-block stretch from Regent Street to Lake Mendota were installed episodically over the decades, including the Memorial student union (built in 1928) along the lakeshore that has long been one of this capital city’s favorite warm-weather gathering spots; a public square one block off the lake; and a collection of campus buildings dating to the 1950s and ’60s. In the last decade, university architects and administrators, working with Madison’s planners, have been more purposeful. Prompted by trends in urban design that emphasize closer ties between retail stores and cultural institutions, open space, recreation and stronger neighborhoods, the university and the city developed a more definitive construction plan. When it is finished, the 2.45 million-square-foot project is expected to have cost nearly $500 million. 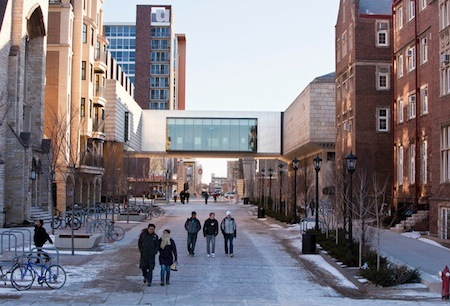 Beyond that aesthetic consideration, four blocks of the gateway are completed, including the latest project, an 81,000-square-foot addition to the university’s Chazen Museum of Art that opened in October. Projects under construction on the remaining three blocks include a hockey center, to be called the LaBahn Arena, and a 104,000-square-foot meeting center and student dining facility. Both are scheduled to open next year. “We wanted to link where people lived, and where they were coming from, to where they needed to go,” said Julie B. Grove, the university architect and project manager, who worked closely with Mr. Brown.